Size of this preview: 800 × 445 pixels. Other resolutions: 320 × 178 pixels | 640 × 356 pixels | 1,024 × 570 pixels | 1,280 × 713 pixels | 4,032 × 2,245 pixels. 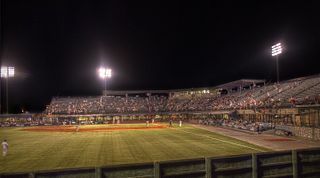 View from the outfield hill of the stadium. This image was originally posted to Flickr by avhell at https://www.flickr.com/photos/39707801@N00/3849215455. It was reviewed on 7 March 2010 by FlickreviewR and was confirmed to be licensed under the terms of the cc-by-sa-2.0.